What is a harmonic wave? This harmonic wave equation calculator will help you establish what is the displacement of any point along a harmonic wave traveling through space. A wave is a disturbance that propagates in space. When it moves through space, individual molecules oscillate back and forth. If the wave is harmonic, then it means that all particles are in simple harmonic motion. If you know the fundamental properties of the wave, such as its wavelength, you will be able to determine the displacement of points along the wave. The displacement depends on two main variables; the time point t and position along the wave x.
Φ is the initial phase of the wave. Let's assume that you want to find out what is the wavelength of a certain wave. You have measured its displacement at two points at time t = 1 s. At x = 0 mm, the displacement was equal to y = - 7 mm. At x = 10 mm, the displacement was also equal to 7 mm, but in the opposite direction (y = 7 mm). Determine the amplitude of the wave. In this case, we can assume it is equal to 14 mm. Find out what is the initial phase of the wave. We can assume it is equal to 0 rad. Plug these values of wave velocity and wavelength into the harmonic wave equation calculator to check whether the result is correct! 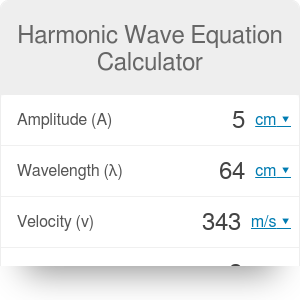 Harmonic Wave Equation Calculator can be embedded on your website to enrich the content you wrote and make it easier for your visitors to understand your message.